SUNET is the organization for the national higher research and education network (NREN) of Sweden. SUNET operates the GigaSunet network, which is built with 10 Gbit/sec DWDM connections in a redundant infrastructure, connecting PoPs in 22 cities, nationwide, and using redundant 2,5 Gbit/sec connections as access towards the universities. It is used by researchers, teachers, students, and administrative personnel on 32 universities and colleges nationwide. In addition to this, some central government museums and external organizations are also connected to the network. 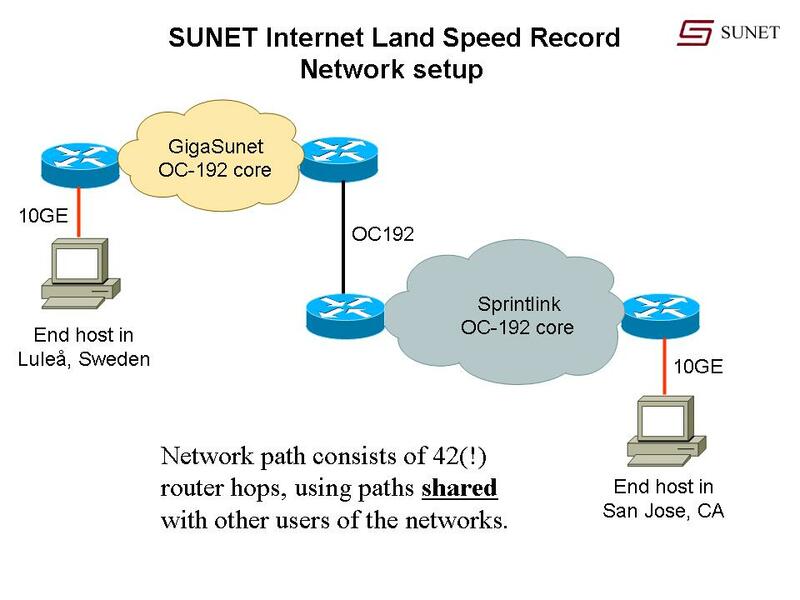 On September 12, 2004, SUNET transferred around 492 Gigabytes of data in about 16.5 minutes, using multiple TCP streams between one host at the Luleå University of Technology (LTU) in Sweden (close to the Arctic circle), and one host connected to a Sprint PoP in San Jose, CA, USA. The network path used is the GigaSunet backbone - shared with other users of the Swedish universites, and the SprintLink core network, used by all the customers of Sprintlink. The transfer was done with the iperf program, available for many different platforms. We have chosen to use NetBSD for our tests, due to the scalability of the TCP code. All routers in the path are Cisco high-end routers, including two of the new CRS-1 routers. Note that this is a path shared with other users of the GigaSunet and Sprint networks! The following graph shows one of the links in the path during the day (several transmissions were done) - showing the record-traffic shared with the normal usage. The complete output from iperf during the transmission as seen from the transmitter and the receiver. The test run lasted 1001 seconds (16 minutes and 41 seconds). Note that this means that we didn't loose a single bit on this path for the duration of the transmission! A tcpdump output is available for the first few Mbytes of the transmission, both in raw tcpdump format and as readable tcpdump output. According to contest rule #7, the distance should be calculated as the terrestrial distance between the cities where we do router hops. Referring to the Great Circle Mapper, the distance is 28,983 km (18,013 miles). We have then used the airport of the city in question as it's location. Record submitted for the IPv4 multiple stream class is 122.367 Petabit-meters/second (which is a 17% increase of the previous record). Most notable is perhaps that our result was achieved on the normal GigaSunet and Sprintlink production infrastructures, shared by millions of other users of those networks. The end hosts are off-the-shelf Dell PC:s (see details below), each with only a single Intel Xeon 2.0/2.8 GHz processor, 1024/512 Mbyte of RAM (sender/receiver), and using the Intel PRO/10GbE LR network adapters. Note that theese hosts are fairly modest in performance compared to any top-of-the line server of today, which makes this record even more impressive! options NMBCLUSTERS=8192 # Increase number of network buffers. link0, link1 # Set PCI-X burst size to 4k. We noted that it is the PC hardware (excluding the Intel PRO/10GbE network adapter) that is the limiting factor in our setup. The operating system, the network adapter, as well as the network itself, including the routers, are capable of handling more traffic than this, but the PCI-X bus and the memory bandwith in the end hosts are currently the bottlenecks. operating system: NetBSD, upcoming version 2.0. Peter Löthberg for ideas, help, debugging, US coordination etc. etc. His help has been invaluable! The Sprint staff in San Jose, Reston and Stockholm, for outstanding support and help. Also special thanks to Sprint for providing bandwidth, and for facilities and housing for the host in San Jose!